WASHINGTON (CNN) -- The U.S. Navy released nine of the 16 suspected pirates it was holding on a ship for the last few weeks, according to defense officials. 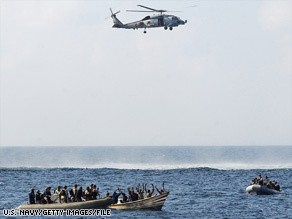 The U.S. Navy apprehends suspected pirates February 12 in the Gulf of Arden. The pirates were released because the Navy did not have enough evidence to hand them over to Kenya for prosecution in court, in accordance with a recent agreement between the United States and Kenya, the officials explained. The nine were brought into Somali waters and then handed over to the Puntland coast guard. Puntland is the self-proclaimed Somali state that includes the point of the horn of Africa. The suspected pirates were detained by the Navy after the captain of the Indian-flagged ship Premdivya broadcast a distress call to all ships in the area that it had come under attack by a small boat. The Navy saw a small boat meeting the description given by the Premdivya, and the occupants were detained and moved to the nearby USS Vella Gulf, where they were held.